This is a post I was really excited to write, so I'm so glad you guys voted for it to be the second to be reviewed from my £100 Too Faced Haul, the first being my Melted Chocolate Milkshake lipstick. I also have an exciting announcement at the end of this post, so keep your eyes peeled! 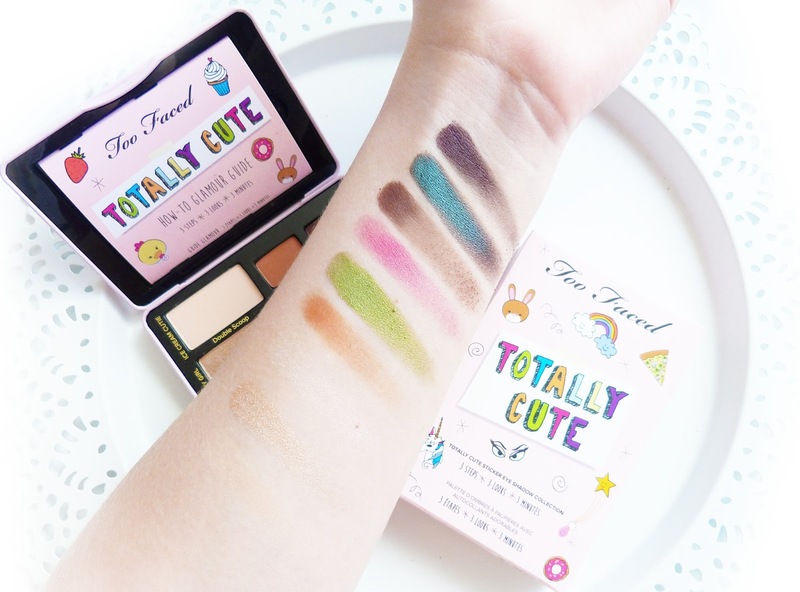 So YAAAAASSS I got my hands on Too Faced's newest limited edition palette, the Totally Cute eyeshadow palette and it is probably the most adorable thing I have ever owned. Obviously, I'm going to have to talk all about the packaging. 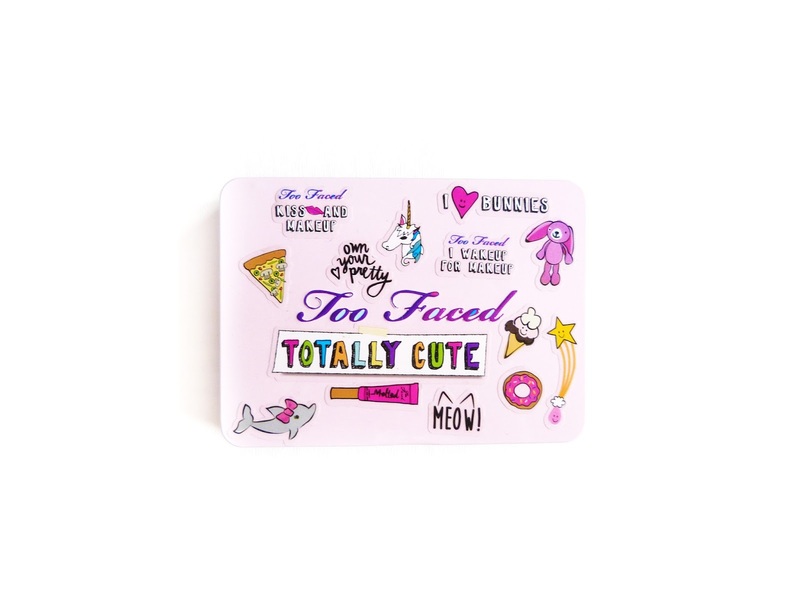 Too Faced have seriously out-done themselves here. The palette is packaged in the prettiest pale pink cardboard box, covered in doodles of unicorns and rainbows, yet still somehow remains chic and classy. The actual shadows come in the usual metal casing which is typical of Too Faced, however the casing itself is initially just plain pink with the Too Faced logo. This is where the fun really begins as supplied with the palette are two sheets of stickers for you to decorate it however you choose! Obviously I was just so into this right from the start and have covered my palette in stickers of pizza, unicorns and bunnies. It's so cute and so badass - I love it. The palette contains nine shades, with three shades being larger pans of shadow, as is the usual with Too Faced palettes. The three larger pans are Double Scoop - a pale, peachy matte, Shooting Star - a silky, golden shimmer, and Unicorn, and iridescent white with a light pink sheen. I've photographed them separately as they don't show up too well in the other photo. The following six shades are made up of two brights, two neutral mattes and two shimmery darks. The bright shades are my absolute favourite, which is coming from someone who lives for neutrals. They consist of Clover, a metallic, grassy green, and I ❤ TF, a frosted fuchsia pink. It literally screams YAAAAAAAAAAAS. The neutrals are Bunny Fu-Fu (dumb/cute name) which is a dark, chocolate-orange shade, reminiscent of the Peanut Butter & Jelly palette. The second neutral is Chocolate Donut, which is probably my favourite shade in the entire palette. It's just the perfect shade of brown, the exact colour of the chocolate icing on a donut. I love it. The dark shades in the palette are Storm Cloud, an iridescent blue-brown shift, similar to Pigeon in Lime Crime's Venus II palette but with a much stronger blue tone, and Meow! which is a dark purple with a slight satin sheen. All of the shades last five to seven hours without creasing or fading. As with all Too Faced eyeshadows, the texture of most of these shadows are really creamy, pigmented and bendable, especially the shimmers. Clover and Shooting star are definitely the creamiest shadows in the entire palette with amazing colour payoff, whilst Double Scoop, Unicorn and I ❤ TF are more powdery and less pigmented than the rest, but are still great shades for the staying power and overall cuteness. 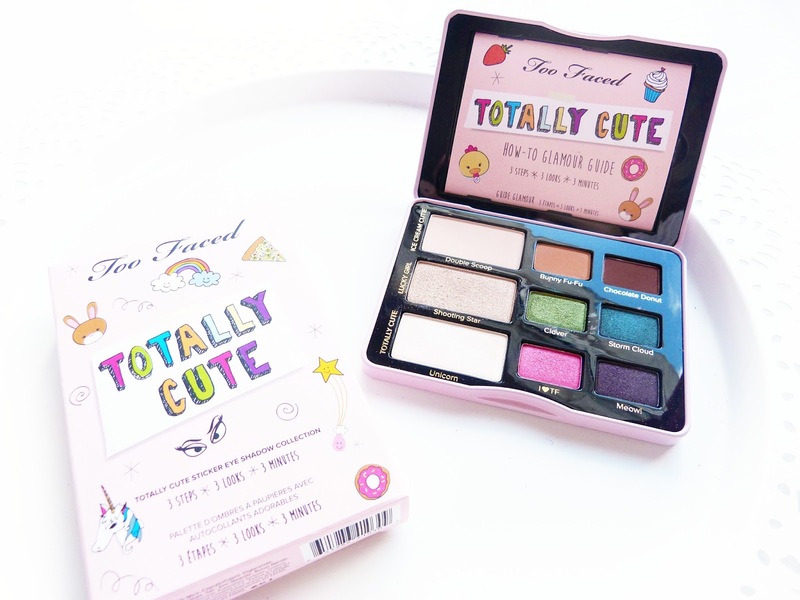 I absolutely love this palette for how fun and cute it is, whilst still being very chic with amazing quality typical of Too Faced. I'm not sure how much wear I'll get out some some of the shades, but Shooting Star and Chocolate Donut have already become firm favourites of mine. I've been hinting on Twitter how close I am to 100k all time views, and I'm pretty certain I'm going to hit it within the next few weeks! 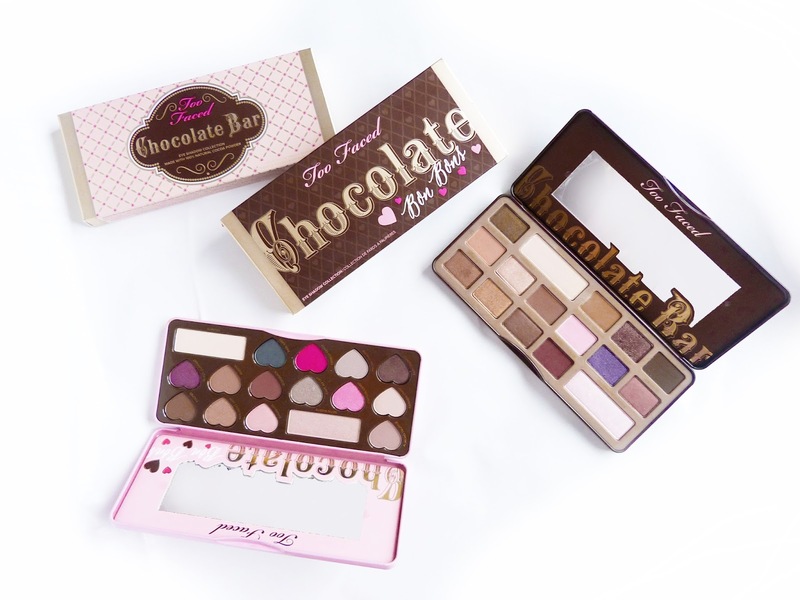 I've decided I'll be doing a giveaway of the Too Faced chocolate bar palette of the winner's choice, along with some other, secret little goodies. I was planning on the giveaway being the week I hit 100k, but I've also been toying with the idea of having it on my birthday (7th October.) Either way, there will be an awesome Too Faced giveaway coming soon, you heard it here first! 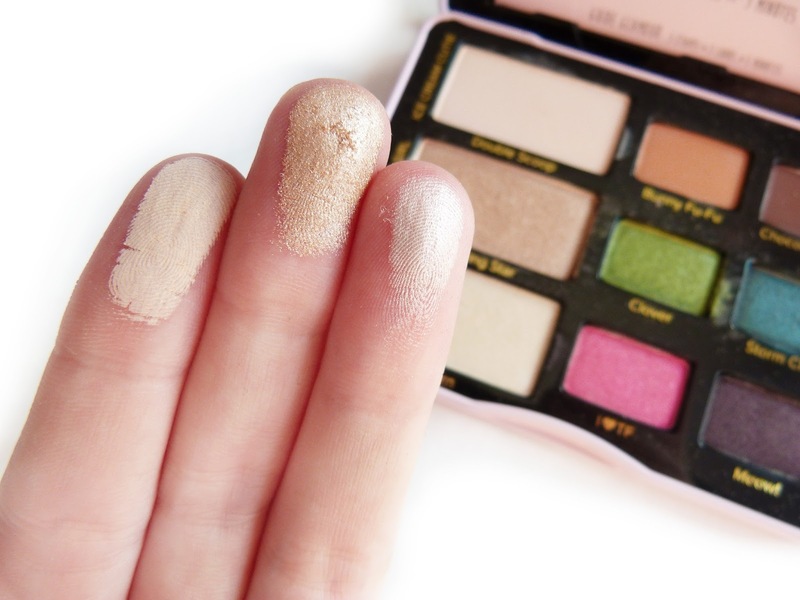 What do you think to this gorgeous new palette? And who's excited for my upcoming giveaway? I know I am! Oh wow that palette is so so cute! I'm really bummed that there isn't a Too Faced store near me, and I'd love to buy it online but I worry about the eyeshadow breaking or something in transit. I'm really excited about the giveaway! I'd love to take part tehe! Oh wow that palette looks incredible! Great post lovely! Also, omg we have the same birthday haha!! This palette definitely lives up to its name - it is very cute!! I do love the colours in Too faced Palettes! Ohh these look super cute! I always forget to wear eyeshadow so i dont often buy it but i feel like i need to branch out more, these colours look so good! That palette is super cute. I really need to get my hands on a too faced palette.